My sister and I went on our annual bird watching trip today and guess what we saw? The picture above was taken at 3pm this afternoon at the San Luis Wildlife Refuge. 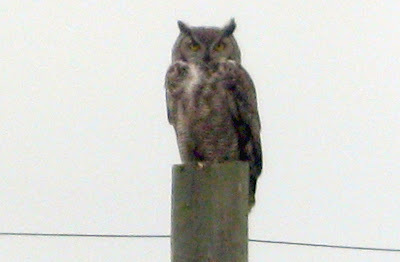 The owl was perched calmly on a post, perfectly happy to let me take several snapshots of him through the car window. It was the best birding day ever. I've been looking for Great Horned Owls at the refuge for the last few years because I read that others have seen them there, but I never had any luck. Today it was the last thing on my mind, especially in the middle of the afternoon, and there he was. Apparently low expectations and a careless attitude are key to seeing great birds. We had just gotten started when a Greater Roadrunner darted across the road. Oh my goodness! Another bird we'd been hoping to see the last few years. 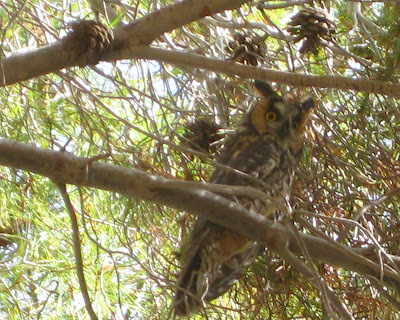 We stopped in at Mercey Hot Springs to visit the wintering Long-eared Owls, which we see every year. Today there were three or four of them roosting in a tree. 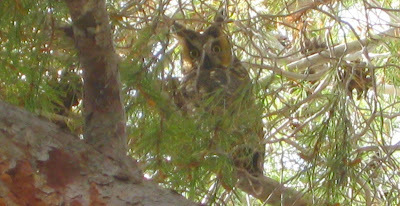 Like the Great Horned Owl, they weren't at all camera shy. Plenty of egrets out and about today, too. 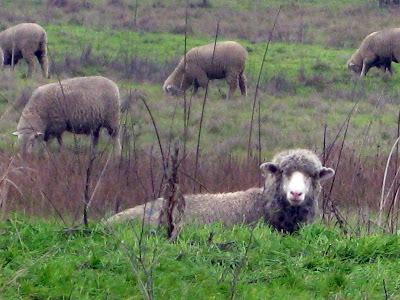 And since this is a knitting blog, I have to include a photo of the lovely wool sheep we saw grazing in the grasslands. What a great trip! I'm a bird lover and the pictures are beautiful. Oh what a nice day for bird watching! 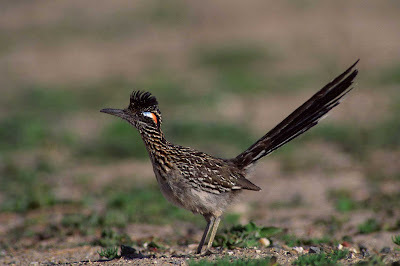 Love the owl pictures and a real live roadrunner...wow! Looks like you had a fun day with your Sister! Nice tradition! Love the pictures. 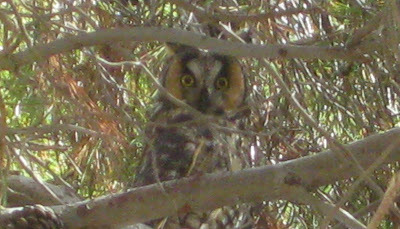 I have an owl that lives on my property along with two bald eagles. I have been wanting to get sheep and seeing you picture has motivated me to browse the ag-ad's. Have a great Sunday. What a fabulous day for you. I went to the Wild Bird Seed store in GV yesterday for their 30 year anniversay party and along with cake they had people from the bird rescue place with an owl, hawk and sparrow. So exciting. Rained last night in GV. Did you get some rain in SJ? oh wow.. these pics are amazing! stacy. Lovely photos! It sounds like you had a great day! Oh you got my heart a pumpin! What a great day you had and Love seeing those owl photos! Hahaha -- all that wool right out there in the wild! You. Lucky. Duck! I've always wanted to see an owl out in the wild, but never had any luck. I love the children's story Owl Moon, and whenever there's a full moon, I always think maybe I'll see an owl, but it never ever happens. Aren't you glad you have this blog? Now you'll always remember it -- how exciting!!!! I love, love, love the owl photos. Wow, what a birding trip! Wish I was there!! What a great day for you! Love the photos. Owls are really amazing birds. We miss our friendly little Saw Whet! Beautiful nature photos....I love the one with the egret in flight!